Servings: 6 to 8 as appetizer. 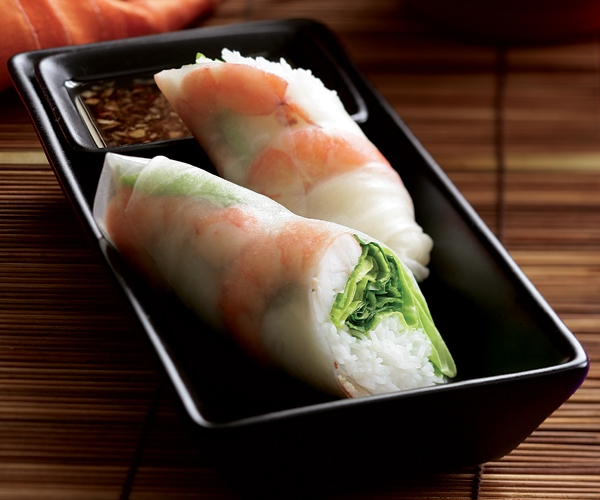 The classic Vietnamese summer roll is as lovely to look at as it is delicious to eat: plump shrimp, fragrant herbs, and rice noodles bundled in a soft rice paper wrapper. For a twist, try substituting Honey Ginger Chicken or Grilled Sesame Beef for the shrimp. 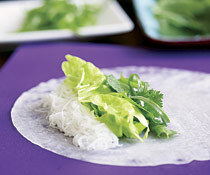 Serve the summer rolls with one or more dipping sauces such as Nuoc Cham or Pineapple Lime Dipping Sauce. Bring a medium saucepan of water to a rolling boil over high heat. 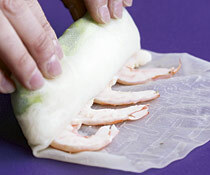 Drop the shrimp into the water and cook until they turn pink and opaque, 1 to 2 minutes. Drain in a colander and rinse with cold water until the shrimp are cool. Peel the shrimp, slice them in half lengthwise, and devein if necessary. Bring a medium saucepan of water to a rolling boil over high heat. Drop in the rice noodles. Remove the pan from the heat and let stand for 8 to 10 minutes, gently lifting and stirring the noodles now and then as they soften, to cook them evenly and to keep them from clumping. Drain the noodles in a colander and rinse them with cold water to stop the cooking. You should have about 4 cups cooked noodles. Arrange the noodles, rice paper wrappers, lettuce, herbs, scallions, and cooled filling (shrimp, beef, chicken, or tofu) around a large cutting board or tray set before you. Have a platter nearby for the finished rolls. 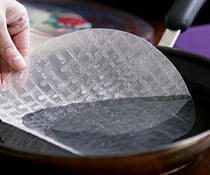 You’ll need a skillet of very warm water to soften the rice paper, and a cutting board or tray to lay it on. Starting on the lowest third of the wrapper and working away from you, line up a narrow tangle of noodles (about 1/4 cup), a row of lettuce strips (about 1/4 cup), 5 to 7 good-size mint leaves, a row of cilantro or basil leaves, and a row of scallion strips. Leave about 1 inch of empty space along the wrapper’s bottom and side edges. Starting from the edge closest to you, roll the wrapper up and over the fillings. Stop after the first turn to tuck and compress everything snugly into the wrapper. Once the first turn is good and tight, fold the right and left sides of the wrapper in onto the roll, closing off the ends, as though making an envelope. 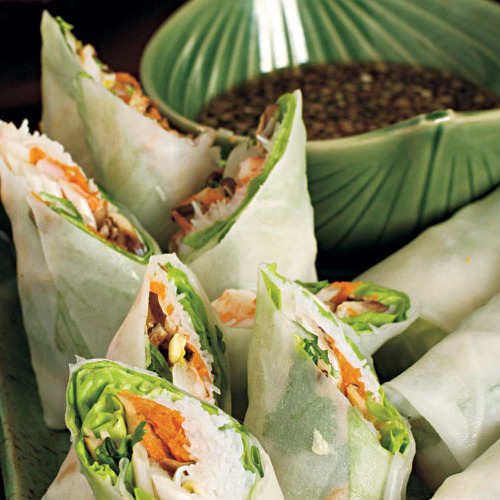 You can assemble summer rolls up to 2 hours in advance as long as you cover them with a damp dishtowel and wrap them well with plastic to keep the rice paper from drying out. Very easy to make and they taste great. I find they store well in the fridge if made ahead (up to one day in my experience). I've been wanting to make these for a long time! They are one of my favorite snacks at the Whole Foods sushi bar, and so have gradually assembled the packaged ingredients. The instructions here are very good and the key is to assemble all ingredients and just dive in. These are very light and tasty and the sauces are especially good. I often make them before an informal family bbq, and involve people in the assembling.